Fossil frogs and toads of North America. 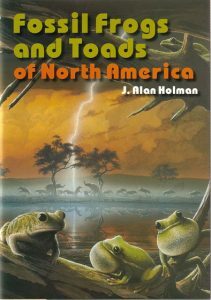 Detailed systematic accounts of the known fossil frogs and toads of North America. Extinct fossil frogs and toads are fully discussed and illustrated and in some cases, rediagnosed and redescribed. 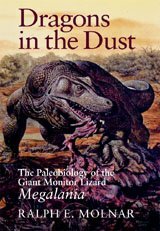 Dragons in the dust: the paleobiology of the giant monitor lizard. The story of Australia’s ice-age reptiles, and how scientists have reconstructed the way these animals lived and what factors encouraged their evolution. Artist/Author: Gasparini, Zulma, et al., editors. Patagonia has been one of the most attractive places for explorers and paleontologists. This work gathers together our knowledge about the evolution of the region and its reptiles. It demonstrates that Patagonia during the Mesozoic gives a distinct perspective on the evolution of life during a key chapter in the geological history of this region. Dinosaurs, spitfires and sea dragons. Comparisons are made between living and extinct animals with reference to gigantism and intellect. 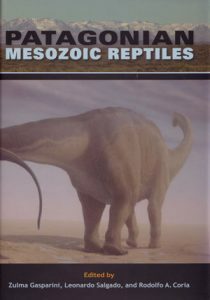 The natural history of the Mesozoic Era is explored. Christopher McGowan sets out to solve same of the enduring mysteries about dinosaurs and other prehistoric reptiles. He makes fascinating comparisons between living and extinct animals while presenting topics that range from gigantism to intellect. 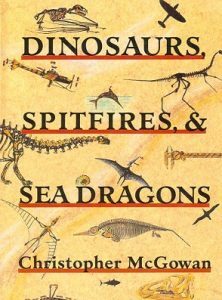 In addition to exploring the natural history of the Mesozoic Era, McGowan draws on science and engineering concepts to explain curiosities such as the similarities between the aerodynamics of pteranodons and Spitfire planes.